Katie Borg, a homeschooled rising senior from Evanston, Illinois, participated in a number of math competitions in middle school and completed all her high-school math courses with Art of Problem Solving (AoPS), finishing with Calculus BC in ninth grade. She then decided that she might want to focus instead on art—it had always been a serious hobby—and put math in the background. She has now returned to math and is considering studying applied math in college, though psychology and music will also be in the mix. She has a store selling her Chinese brush paintings, is involved in Model UN, enjoys acting and theater, and relaxes by baking and writing creatively. 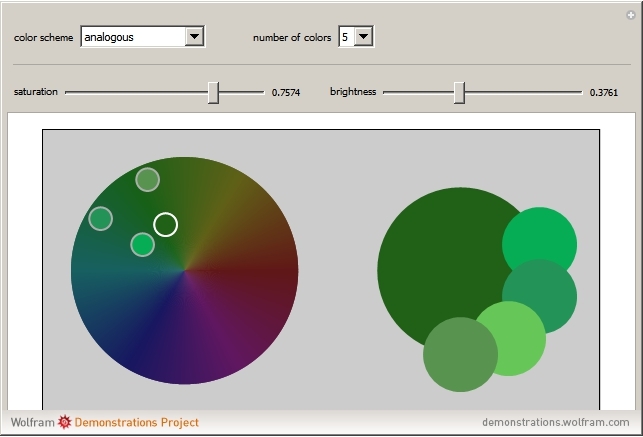 After picking a starting color from a displayed color wheel, a palette (monochrome, analogous, complementary, split-complementary, triadic, or tetradic) of five, six, or seven colors is generated, using the given color as a starting point.